... always look for birds when you're driving on Fair Isle. Two posts in a day, I'm spoiling you! The fog never fully lifted, but whilst I was driving round the island checking the sea state and visibility in the south, it became apparent there were a few birds were new in. A cursory glance at a few gardens picked up Lesser Whitethroat, 2 Spotted Flycatchers, 2 Willow Warblers, Blackcap and Siskin, before a female Red-backed Shrike flew in front of the van near the School. Nice. By this point, I was almost running late for lunch (never a good idea on a Sunday) and was wondering whether I should stop for a quick check in the Field ditch, as the cover there often attracts late spring migrants. My decision was made when I saw a pale looking warbler perched in the front of Charlie's Trees (the small patch of small roadside willows between Setter and Field). Brakes hastily applied, bins grabbed and there, sat in front of me, was a Paddyfield Warbler. Very nice. 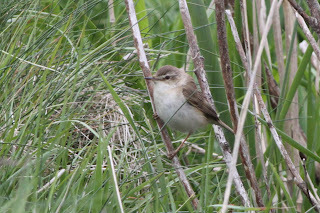 The Paddyfield Warbler showed very well a lot of the time, although would sometimes prefer skulking low in the willow. 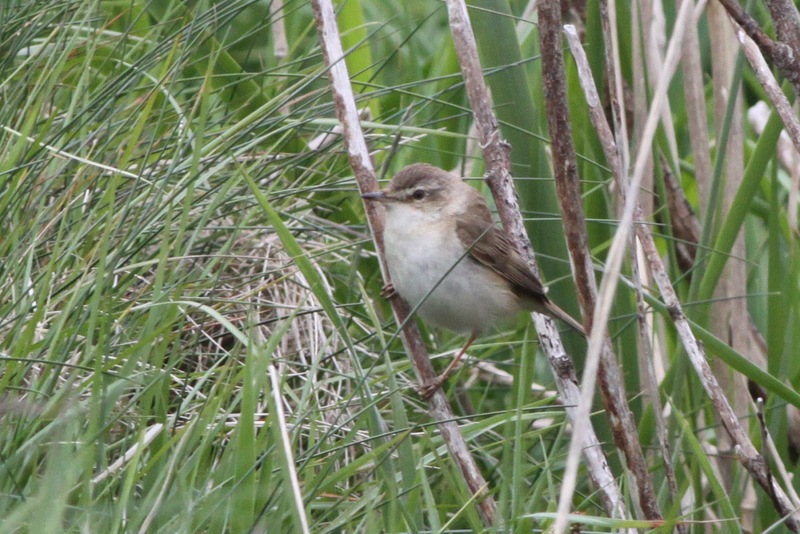 Last year, the day we stopped doing census (to do the Kittiwake count) a River Warbler was found, this year it's a Paddyfield Warbler, we should maybe schedule a Kittiwake count more often! A brave few twitched it before lunch (but the kitchen team kindly kept us some food back for when we returned!) before the other interested guests were able to connect with it after a lovely roast dinner and peach upside down cake with chocolate sauce. Sadly lunch wasn't pork chops (which would have invited some 'Daddy or chips/Paddy or chops' type pun) and despite it being Father's Day, I couldn't even come up with a related Paddy/Daddy pun - feel free to add yours as a comment if you can think of anything! Maybe there'll be more birds later today, this spring doesn't seem to want to come to an end just yet. Who's the Paddy!" ...Not very original but hey, it is father's with a twist! Ha ha, thanks fellas! More south-east winds coming up - could be more birds to come - not long until autumn now as well!